Across the country and in our own backyard..
..teachers are redefining expectations and raising the bar for their students. Superintendents and principals are leading their campuses through transformative changes. Nonprofit providers are supporting children and families in a quest to defy the status quo. Businesses are connecting meaningfully to our community’s youngest citizens. In short, there are stories of excellence that should be celebrated, shared and replicated. One of the central benefits of a countywide partnership is the wide net from which we capture practices that are already working for students. Through analysis of data, we can identify effective practices and help spread them more broadly. 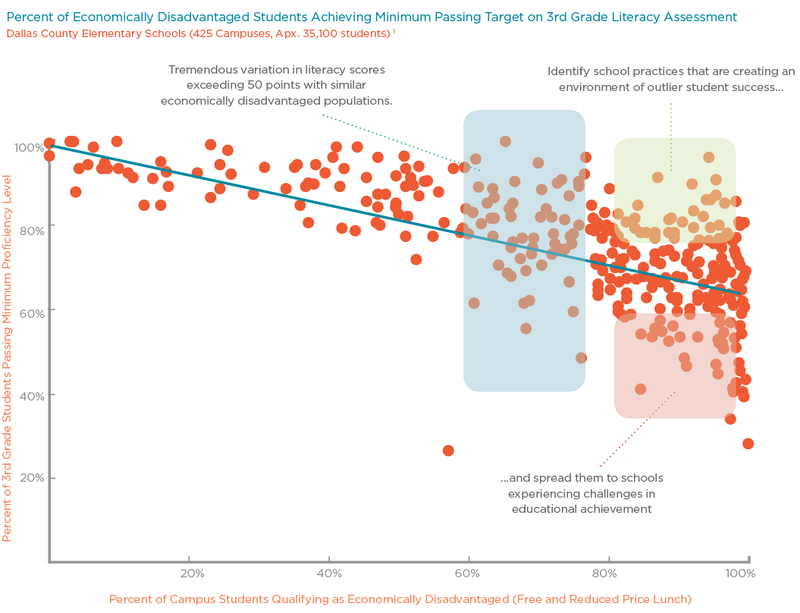 For example, below is a scatter plot that shows 3rd grade reading performance and poverty across Dallas County. Each dot represents an elementary school. While the chart unfortunately shows an overall disparity between economically disadvantaged schools and more affluent ones, it also gives us reason for hope. There are many schools with large numbers of economically disadvantaged students who are beating the odds. Guided by this data, the Partnership identifies these pockets of excellence and attempts to learn what underlies their success. We use that same data to identify areas of greatest opportunity so that our community can align its resources to spread effective practices and move the needle on student achievement. We share effective practices of partner organizations through our Stories of Impact. These case studies illuminate practices that are improving outcomes for Dallas County students so that powerful ideas can be recognized and spread.